The 2016 Chevy Malibu LT Sedan is a mid-level trim equipped with all kinds of exciting features, yet still accessibly priced. On the LT trim, you can expect features like OnStar with 4G LTE Wi-Fi, Sirius XM Satellite Radio, LED daytime running lamps, an eight-way power drive seat with power lumbar control, and much more. The Chevy Malibu is known for offering luxe features at a low price point, so you’ll be set no matter the model year. Find out why Kelley Blue Book is a fan of the Malibu, then stop by Patsy Lou Chevrolet to take a Malibu LT for a spin! 2016 Chevrolet Malibu LT 1LT Back Up Camera, 17" Aluminum Wheels, AM/FM radio: SiriusXM, Power Driver Lumbar Control Seat Adjuster. Odometer is 13321 miles below market average! PATSY LOU BUICK GMC/ MEGA LOT 810-732-7500. 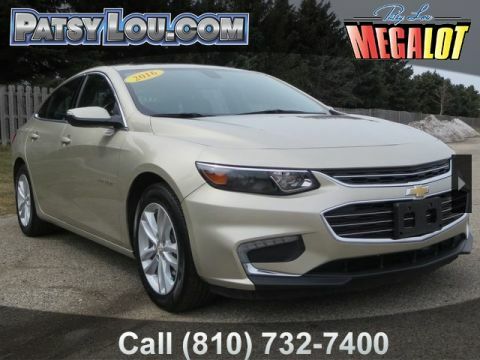 If you’d like to take a 2016 Chevrolet Malibu LT Sedan for a test drive or are interested in browsing the rest of our wide selection of vehicles, visit our Flint Chevy dealership today!